After President Yoweri Kaguta Museveni’s tough response to the current opposition protests against the rising food and fuel prices, I knew Monday was going to be an episode worth booking. 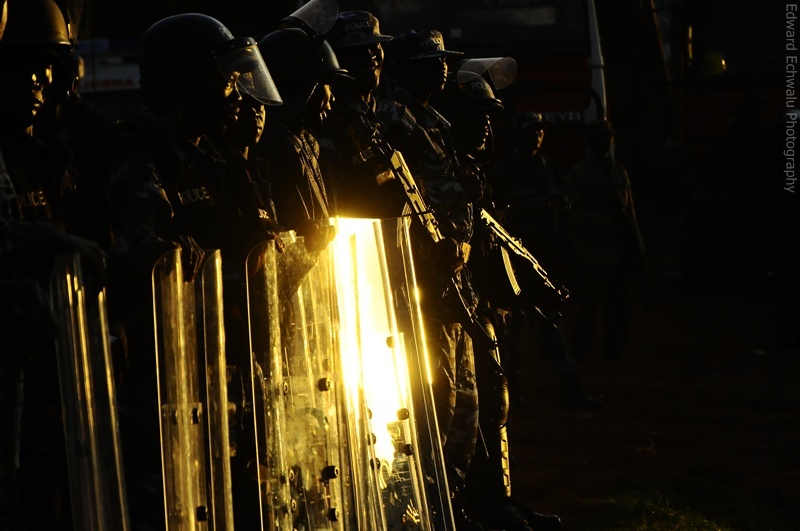 Ugandan anti-riot policemen stand guard outside Kasangati Police Station where Uganda's Forum for Democratic Change (FDC) leader Kizza Besigye was held after being arrested in Kampala, April 18, 2011. 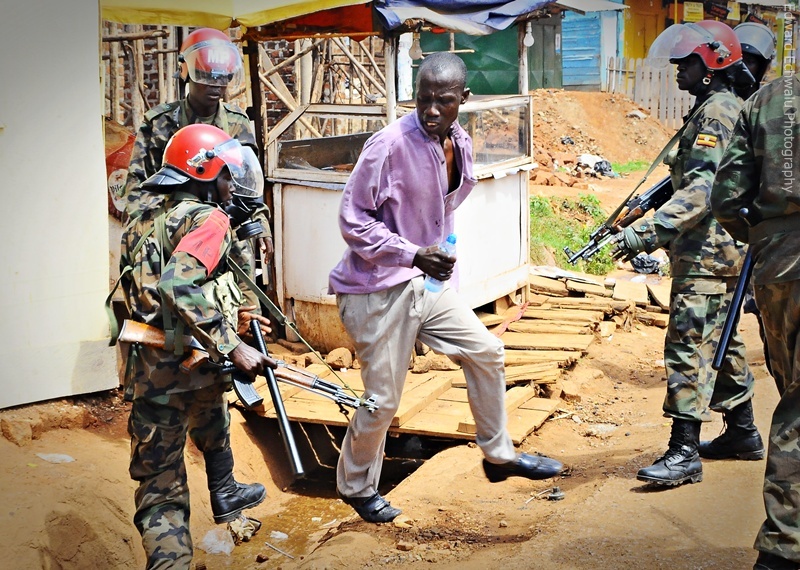 “We made it clear to Besigye that you are not going to demonstrate or to walk. If you want to walk, go somewhere and take a walk.” President Museveni said during a media briefing at his home in Rwakitura on Saturday. I woke up at 5am, connected with a colleague in Wandegeya and headed for Kasangati which has been a battle field for the last three weeks between Kizza Besigye and the Police/Army. Kasangati is where Besigye resides. We were at his gate at 6:30am. Waited for about three minutes before Museveni’s closest rival in the just concluded elections stepped out of his gate in company of four others. One was his personal aide. Before the drama would start, it suddenly ended. 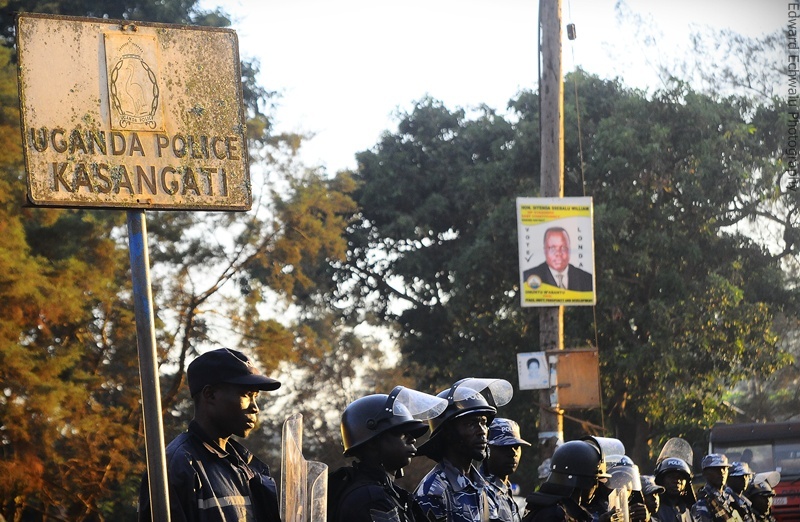 About 300metres from Besigye’s home were four police cars. One occupied by ant-riot police and the others by planed clothed men. 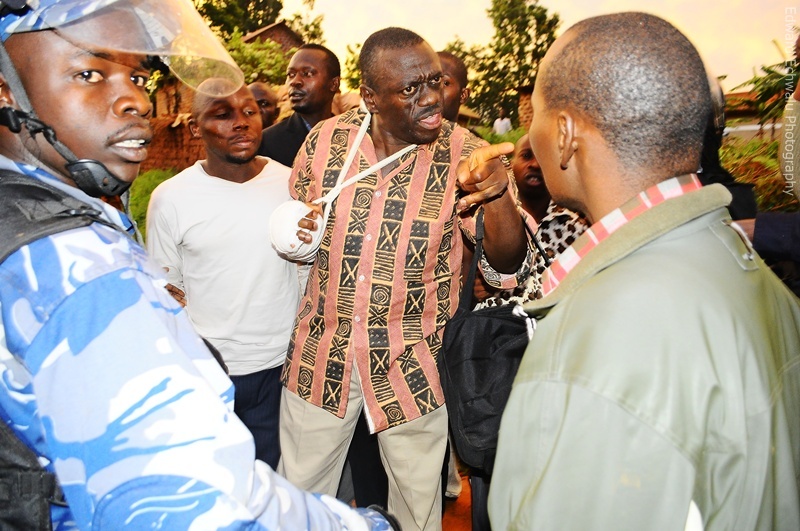 Besigye was not bothered, like he expected they would be there anyway. He was however stopped and told to jump on the waiting pick-up patrol car that had closed in by right hand side. As usual, the “whys” came in. He would not. 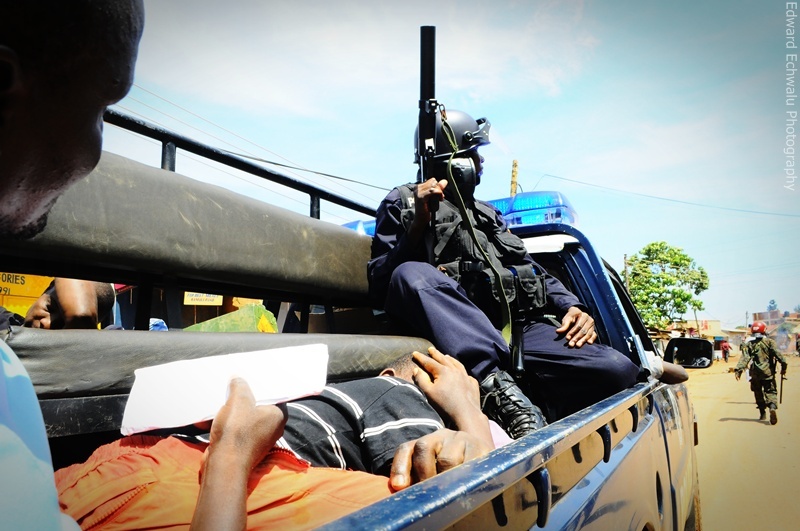 So they carried him unto the pick-up car and sped off to Kasangati Police Station. He was later charged with inciting violence and released on bail. When we reached the police station a few minutes later, the media was denied access. We were allowed to look on helplessly, about 100 metres away. As Kizza Besigye was locked up in Kasangati, other opposition members were being arrested resulting into chaos in most parts of the city. 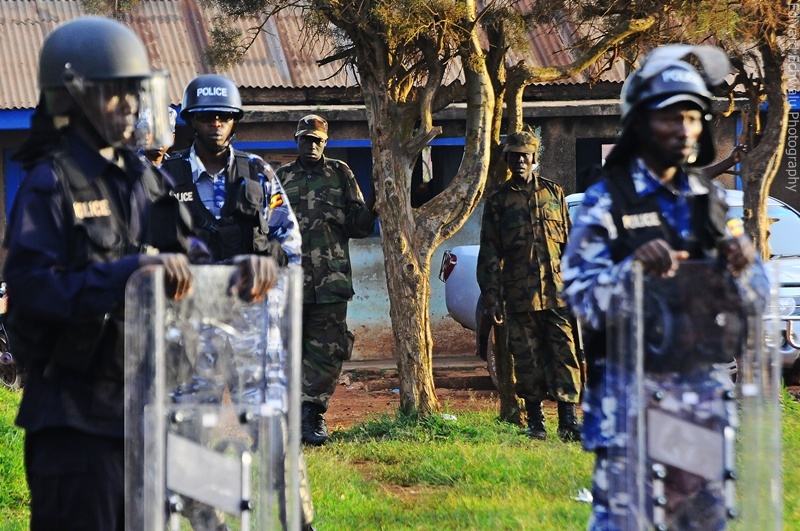 Kireka and Bweyogerere, both Kampala suburbs, opposition supporters battled the army and police for most of the afternoon. They blocked roads and burnt tires. Actually smoke would be seen kilometers away. 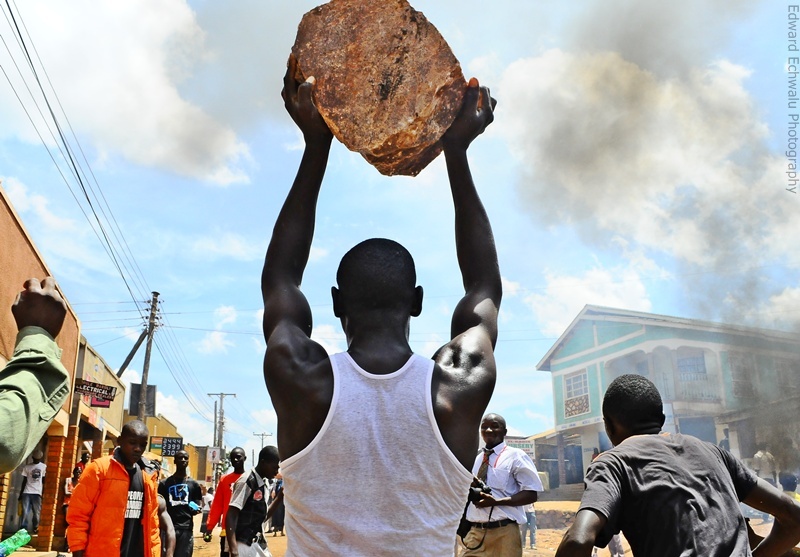 A demonstrator carries a stone to block a road during a protest against the arrest of opposition leader Kizza Besigye in Kireka suburb of the capital Kampala, April 18, 2011. 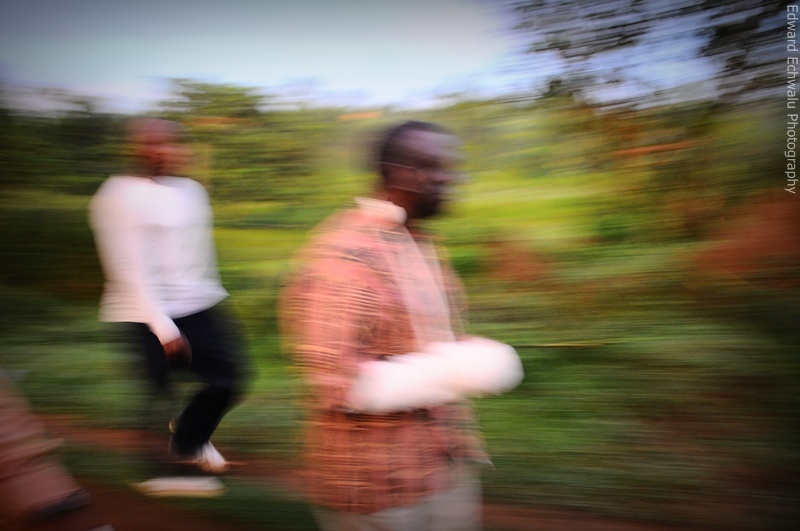 The drama went on, and on and on…….Now Kizza Besigye says he’s walking again on Thursday..Walk to work part IV coming.